First published in November 2009 in various media. Reproduced here for archival purposes only. Harare North is a meandering journey undertaken by an unnamed main character fleeing imaginary trouble back home in Robert Mugabe’s Zimbabwe (you get the story already, sorry!). He heads for London (aka Harare North) and proceeds to lead a wretched meaningless existence. Saddled with a not-so-bright friend named Shingi he immerses himself in the under belly of the immigrant community in London building tricks to stay above water. It is not a pretty book but this is not just because of the wretched lives these people live in the grimy underbelly of grimy London. This is an unfortunate book for reasons that are the fault of Chikwava and publishers eager to publish and sell reams of Africa’s dignity to a willing and gullible Western audience. What is it with African writers and stereotyping? In the 21st century many of them are still scheming their way into the pockets of gullible Westerners who truly believe that Africans are exotic lovable dolts to be watched like animals in a zoo. I am not amused. 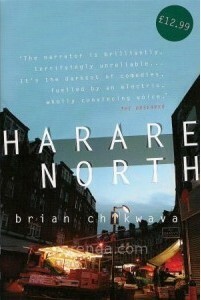 On one level, Harare North is a brilliant book, written by a brilliant, sensitive author with the potential of shining a compassionate light into the lives of immigrants of color living desperate, furtive lives in the shadows of London. And sometimes it works. Chikwava lays bare the tricks that immigrants turn to somehow survive in London. But then, what’s with the contrived English? Harare North is engaging and heart-warming, but the contrived English gets in the way, each time. It is like finding your favorite meal infested with tiny obnoxious stones. The book offers evidence of formerly elegant prose poetry ruined by reckless experimentation with contrived English. There is no linguistic structure to it because the language simply doesn’t exist. Profound thoughts become distressed babble under the weight of dysfunction. Not convincing, the contrived result. Chikwava has dissipated vigorous energy to write nonsense. It is funny but it is nonsense. Chikwava taps brilliantly into the lode of indignities and humiliation that Africans endure inside Western embassies and then promptly loses it in the fog of contrived language: “…the British High Commission don’t just give visa to any native who think he can flag down jet plane jump on it and fly to Harare North, especially when they notice that people get them visitors’ visa and then on landing in London they do this style of claim asylum. So people is no getting that old consulate treatment: the person behind the counter window give you the severe look and ask you to bring more of this and that and throw back your papers, and before you even gather them together he have call up the next person.” (p 6) What is the purpose of this exercise? Pa, you just made a nonsensical story sound good, else, Harare North is a fine story telling exercise. The “pathetic” attempts at ebonics may not have worked for you because you are far too high on the literary food chain, but I think it has it’s imports. For as far as pragmatism goes, it doesn’t work for all of the people all of the time: this very notion is the force at play here. Thank you, anyhow, Dear Pa, for this eloquent take on Harare North. You have whetted my appetite for good literature yet again. Please keep them coming. Yours sincerely.